Part of WikiProject United States. An OSM project, now at version 1.8.5 (incorporating Autumn 2018 AASHTO approvals), mapping the U.S. Bicycle Route System (USBRS). "The USBRS is a developing national network of bicycle routes, linking urban, suburban, and rural areas using a variety of appropriate cycling facilities. To date, 40 U.S. Bicycle Routes (USBRs) spanning over 13,131 miles (21110 km) have been established in the District of Columbia and 26 states: Alaska, Arizona, Connecticut, Florida, Georgia, Idaho, Illinois, Indiana, Kansas, Kentucky, Maine, Maryland, Massachusetts, Michigan, Minnesota, Missouri, Nevada, New Hampshire, North Carolina, Ohio, Pennsylvania, Tennessee, Utah, Vermont, Virginia, and Washington state. Presently, more than 40 states are working on U.S. Bicycle Routes. These routes are selected and maintained by state Departments of Transportation (DOTs), and designated and catalogued by the American Association of State Highway and Transportation Officials (AASHTO)." Source: Adventure Cycling Association (ACA). The fully realized System intends to encompass approximately 50,000 miles (80470 km) of routes to become Earth's largest official cycling route network. By using OSM to create high quality maps of this growing network (and wonderful national resource), we can promote its further development and use. OSM is now a positive tool for geographic communication of existing and developing bicycle routing at local, state and national levels in the USA! bike shops, toilets, drinking fountains, even pubs! Waymarked Trails: Cycling by Sarah Hoffman is a layer superimposed over mapnik (Standard Map Layer) which shows marked cycle routes around the world. Updated minutely, it renders actual routes without the state=proposed tag. Therefore no proposed routes (or proposed numbering protocols) are displayed. Since July 2013, OpenStreetMap contains all approved USBRs (or endeavors to do so as routes are newly approved by AASHTO). These are tagged with type=route, route=bicycle, network=ncn, ref=USBR # and cycle_network=US:US. In the Cycle Map layer (OpenCycleMap, or OCM), these display as solid red lines badged with red USBR numbers. Cycle Map also displays proposed USBRs (ongoing proposals distinctly moving towards AASHTO application as USBRs — or better, actual USBR application ballots before AASHTO) as dashed red lines badged with red USBR numbers. The Cycle Map renderer displays both approved and proposed routes, and the Waymarked Trails: Cycling (Lonvia) renderer displays only approved (not proposed) routes. USBRs which traverse a single US state are expressed with a type=route relation, while USBRs which traverse multiple US states are expressed as a super-relation (here, a type=route relation containing only other type=route relations). If and only if routes are members of a super-relation, add name=USBR # (Name of state) to each member relation, to better identify them. Largely because of disparities in state funding levels, on-the-ground USBR signage improves patchily across the System. OpenStreetMap in the US also contains four significant national-scope bicycle routes (which display in OCM as solid red lines badged with red route acronyms), not strictly part of the USBRS: East Coast Greenway (ECG, which both shares and diverges from segments of USBR 1), Mississippi River Trail (MRT, identical to USBR 45 & 45A in Minnesota), Western New England Greenway (WNEG, identical to USBR 7) and International Selkirk Loop (ISL). ECG and MRT traverse several states over several thousand miles/kilometers. Hence, these two quasi-private (neither government-sanctioned nor approved by AASHTO, but public data) bicycle routes are determined to be so "national in scope" in the USA that their inclusion in OSM's national cycleway network is asserted as named (not numbered) quasi-national network=ncn routes. WNEG is a third such quasi-national route: while shorter than ECG and MRT, WNEG connects Canada to the Atlantic Ocean at ECG. ISL crosses the Canadian border and is tagged cycle_network=US;CA, so ISL is "both" international (via its network=icn tag) and quasi-national (via the US component of its cycle_network=* tag), which does not render in OCM, but does render in Waymarked Trails: Cycling. As quasi-national routes tagged cycle_network=US, ECG, MRT, WNEG and ISL exist alongside USBRs in OSM's national bicycle route hierarchy, but are not USBRs (except for USBR 45 and 45A in Minnesota, which are "both" USBRs and part of MRT, and noting that USBR 7 is identical to WNEG). It is easy to see if a USA national-scope bicycle route is national or quasi-national: national routes (USBRs) display red numbers in their OCM shields, while quasi-national routes (ECG, MRT, WNEG, ISL) display red acronyms in their OCM shields. If you seek to download USBR GPX files, thanks to ACA who offer these for free download via RideWithGPS (and have no objection to our link). See some historical Discussion about this. United States Bicycle Route 10 4274011 4274011 Washington, Idaho, Michigan (current western terminus in Iron Mountain does not quite reach Wisconsin. Michigan DOT notes it is working with Wisconsin DOT to extend to Wisconsin). United States Bicycle Route 15 8257568 8257568 Georgia, Florida. Both states are 100% complete, though as entered now both benefit from a "double-check review." (Remove this comment after completing review). USBR 15 in Georgia was OSM's first entered as directional: other routes are non-directional (and route data entered/stored non-directionally can confuse some algorithms, for example, the GPX link of BrowseRelation). It is a strong intention of this WikiProject that all new USBRs are created as a super-relation containing two directional routes (per state, as this one is in both states, so the Relation entry is green). Congratulations to user:Dr Kludge for achieving this important milestone with USBR 15 in Gerogia and user:micahcochran for continuing the trend in Florida! United States Bicycle Route 35A 6062629 6062629 Indiana. Discontiguous route in a single relation. United States Bicycle Route 36 5552101 5552101 Pennsylvania, Illinois, Indiana. United States Bicycle Route 50 2532740 2532740 District of Columbia, Maryland, Pennsylvania, Ohio, Indiana, Nevada. In Ohio, note that although ODOT's website features the alternative green shield, it has not received approval from FHWA to use it, so renderers should use the black and white shield for now. United States Bicycle Route 87 7644264 7644264 Alaska, Washington. United States Bicycle Route 95 7644263 7644263 Alaska, Washington. United States Bicycle Route 97 7644262 7644262 Alaska. Minor improvements might be made: USBR 97 uses Alaska State Route 1 north of Anchorage and that is a limited access highway for a portion there. 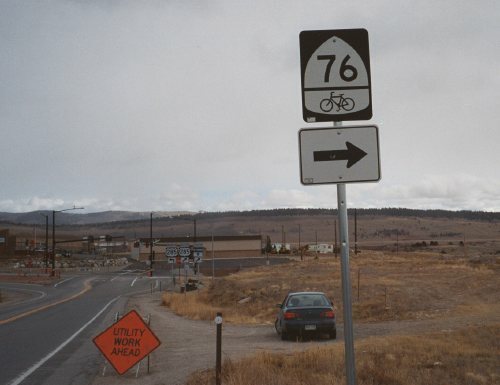 As to the specific routing of USBR 97 along this stretch where bicycles are prohibited: "does the route use frontage roads or a trail along that section? It may be that there is a trail that parallels the freeway, can we confirm?" Alaska DOT notes: "The shoulder is closed to bicyclists at the North Birchwood overpass and cyclists are directed to the pathway on the east/south side of the highway until the Hiland road overpass, at which time the path is on the west/north side of the highway. The route through the downtown Eagle River area is a bit confusing." OSM endeavors to correct its data here. It is critically important not to assume that a USBR corridor plus a guess on your part (for example, that there is already a state or regional route through that corridor) "means" that you can or should enter a proposed USBR into OSM. Only do so when you have solid knowledge that there is coordinated statewide activity actively assembling a USBR. This usually happens only as towns and cities along the route, affected counties, and the state Department of Transportation are all communicating and exhibit active and involved coordination, publishing something more substantial than an incomplete or simple draft map: an "active statewide project." (OSM's so-called "high bar standard" for entering a proposed USBR. The subsequent step, immediately prior to approval: a state application on AASHTO's next ballot, which is our "very high bar standard.") As the AASHTO approval process completes twice a year (in spring and autumn), a rough timeframe of a route first arriving here, proceeding as an application before AASHTO's ballot then gaining approval and OCM render/display is about six weeks to six months. However, some routes emerge and experience a rapid growth life cycle, quickly rocketing to Approved, while other routes have languished in this Proposed table for years. In addition to type=route + route=bicycle, tag such proposed statewide relations with network=ncn + cycle_network=US:US + ref=USBR # + state=proposed. Please add source=Where you learned the route members (e.g. "State DOT web site," "County Bicycle Committee Meeting, 9/9/2014" or "Pending AASHTO application"). Only if a route is a member of a super-relation with other routes sharing the same route number, add name=USBR # (name of state) to better identify each state's route as a super-relation member. In the earliest stages of an existing network=rcn state route becoming a proposed network=ncn USBR, you may wish to simply add an ncn=proposed tag to the existing state route. In Cycle Map layer, this superimposes a dashed red line on top of the existing solid purple line (with no red numbered shields, keeping the purple numbered shields). If you do this (shortcut), it is correct to eventually update relation tags so they include those in the previous paragraph, as this requires changing the ref=* value from the rcn-numbered (state) route to the ncn-numbered (USBR/national) route. An intermediate status in this scenario may be two relations: initially the state relation, then the shortcut of adding ncn=proposed to the state relation, then two relations (one representing the actual state route, another representing the proposed USBR/national route) which probably stay synced, then (likely) back to a single relation after AASHTO approval (assuming the state relation is deleted, having become subsumed by the USBR). Creating super-relations (containing multiple relations of network=ncn routes, each relation containing road/cycleway members within a single state) is only appropriate for proposed routes when they are simultaneously proposed in multiple states. In this case, create one relation to contain road/cycleway members within a single state and similarly, another relation within another state. Then, if at least two states have an incipient network=ncn route proposed as a single numbered USBR, assemble these into a super-relation with state=proposed. A current example of this is proposed USBR 90 in Alabama, Mississippi and Louisiana: exactly these three statewide relations are in the super-relation for proposed USBR 90. The states need not be contiguous. What follows are not yet approved USBRs, they are only serious proposals, with widely varying levels of activity. When at least this level of USBR development activity happens in a state, whether to an existing network=rcn route or with an as-yet-unmapped-in-OSM route, consider tagging the route as above where it is proposed. (Such consideration must meet at least the "high bar standard:" knowledge of a DOT's project to distinctly move towards a USBR application, not simply a corridor or vague draft map, but actual turn-by-turn directions of a largely complete route). As with any route, this means initially creating a properly-tagged relation, then adding/editing member roads/cycleways to that relation. Also, please do your best to keep this wiki table updated with your progress, for example, create a BrowseRelation entry for each new route relation. If you don't or can't update this table, please contact stevea with notes of your progress. Finally, please keep this table synchronized with state registry wikis (for example, Ohio). USBR 11 West Virginia 4275963 4275963 MD (done), WV, VA, NC Incipient in West Virginia, entered into OSM. Proposed to follow the Blue Ridge Parkway to Front Royal and then mostly secondary roads to Harpers Ferry, West Virginia. Identified in ODOT's Access Ohio 2040 transportation plan as that state's highest priority USBR. A draft route map indicates it will largely follow the Ohio to Erie Trail Ohio to Erie Trail, superseding State Bike Route 1. As that is an existing state route, correctly entered into OSM as a network=rcn, we wait on further efforts until ODOT moves closer to an active USBR 21 project before we might tag existing Ohio rcn ref=1 with ncn=proposed, include rcn ref=1 members in a new ncn ref=21 relation, or create a new ncn ref=21 relation different from rcn ref=1. However, as the segments between Mount Vernon and the intersection of Licking County's Foundation Road and Clover Valley Road (including the "Centerburg-Rich Hill Spur") are not shared with any other state or national bicycle route, these are seeded as a stub of proposed USBR 21 in Ohio. Kentucky's DOT has a USBR 21 application "pending before AASHTO via email ballot" from the Autumn 2018 round. Kentucky route data are found here. The entire route is entered, OSM simply awaits news from AASHTO whether the email ballot grants or denies approval. If approval is granted, the route has tag state=proposed deleted and "Kentucky" is added to the 23 row of the Approved section. If approval is denied, the route is removed from OSM and that is denoted here. The route data as entered benefit from a "double-check review." This row would be green because of this, but for Ohio (above) and Tennessee (below). Tennessee indicates (via Georgia 21 ballot) that it plans to allocate USBR 121, implying some early development of 21 (and 121). However, no active state project in Tennessee is known. USBR 23 Kentucky 8843677 8843677 AL, TN (done), KY Kentucky's DOT has a USBR 23 application "pending before AASHTO via email ballot" from the Autumn 2018 round. Kentucky route data are found here. The entire route is entered, OSM simply awaits news from AASHTO whether the email ballot grants or denies approval. If approval is granted, the route has tag state=proposed deleted and "Kentucky" is added to the 23 row of the Approved section. If approval is denied, the route is removed from OSM and that is denoted here. An Alabama DOT document from 2009 says on page 12 "it is recommended that the U.S. Bike Route 25 in Alabama be the same as the Underground Railroad Bicycle Route." However, Alabama appears not to be further developing this route nor does it have an active project to bring it to AASHTO. This is tagged network=rcn + ref=UGR + cycle_network=US:ACA + ncn=proposed so the first two keys display a solid purple line badged with purple UGR shields, and the last key superimposes a dashed red line (with no red 25 shields). Alabama state bicycle route NS1 is substantially similar to this route, and in fact NS1 and UGR parallel each other in much of the state: from Mobile north to Aliceville, where to follow both UGR and the USBR 25 corridor, Alabama state bicycle route C9 branches northwesterly to Mississippi. These developments help boost this row from red to yellow. Mississippi's UGR segment is tagged network=rcn + ref=UGR + cycle_network=US:ACA. Noted as the Mississippi relation in this row is ACA's UGR, though as no active project in the state is known of to promote this regional route to USBR 25, no ncn=proposed tag is added. Tennessee's UGR segment is tagged network=rcn + ref=UGR + cycle_network=US:ACA. Noted as the Tennessee relation in this row is ACA's UGR, though as no active project in the state is known of to promote this regional route to USBR 25, no ncn=proposed tag is added. Kentucky's DOT identifies a state bicycle route as a "USBR 25 AASHTO Identified Corridor" called "Underground Railroad Bike Tour" (URT), tagged network=rcn + ref=URT + cycle_network=US:KY. This is two discontiguous segments as the route slips into Indiana at Brandenburg, then re-emerges into Kentucky at Milton. No active project in the state is known of to promote this state route to USBR 25, so no ncn=proposed tag is added. Indiana contains a portion of ACA's UGR route (from Maukport, near Brandenburg, Kentucky to Madison, near Milton, Kentucky), but this neither aligns (well) with the USBR 25 corridor nor is it entered into OSM. In Ohio, ODOT's Access Ohio 2040 transportation plan targets designation of USBR 25 after USBR 21. A draft route map indicates that the route will follow the Ohio to Erie Trail Ohio to Erie Trail from Cincinnati to Xenia (as proposed by OKI ), the Creekside Trail Creekside Trail to Dayton, the Great Miami River Recreation Trail Great Miami River Recreation Trail and Canal Run Canal Run to the outskirts of Piqua, and roads from there on north. USBR 25 is currently mapped according to this proposal from Cincinnati to Xenia. As other potential USBR 25 in Ohio segments are now entered into OSM as actual statewide (network=rcn) routes, it seems best to leave these as they are until Ohio moves closer towards AASHTO application. However, March, 2018 news from ACA is that USBR 25 in Ohio is very much a route in development at ODOT and that it could be on the Autumn, 2018 AASHTO ballot. Therefore, ncn=proposed is being added to selected segments of the route (Cincinnati to Xenia) as ODOT identifies these on its web site. (ACA's UGR Ohio route branches from early proposed USBR 25 southeasterly from Milford to the Kentucky border at Aberdeen). These developments help boost this row from red to yellow. In Ohio and Michigan (and Ontario, Canada), ACA's UGR diverges significantly from the USBR 25 corridor. USBR 25 might continue northward through the Lower Peninsula of Michigan to Detroit, Bay City and Mackinaw City, but no state project is known to be extant and little if any geo data are available. In Ohio, ODOT's Access Ohio 2040 transportation plan targets USBR 30 designation after USBR 25. A draft route map calls for USBR 30 to follow the nascent North Coast Inland Trail. USBR 30A Ohio No relation yet OH:SAN, OH:ERI, OH:LOR Not mapped yet. Proposed as part of ODOT's Access Ohio 2040 transportation plan. Stalled here (as a "red proposed route") until this gets further momentum from ODOT. (Too vague as a draft route to be considered a serious proposed route). In Mississippi, Natchez Trace Parkway (NTP) is emerging/incipient as USBR 35 (and possibly part of 25). This is tagged network=rcn + ref=NTP + cycle_network=US:NPS + ncn=proposed so the first two keys display a solid purple line badged with purple NTP shields, and the last key superimposes a dashed red line (with no red 35 shields). Note that in Mississippi there are two distinct NTP relations: one for the route=road, the other (noted here) for the route=bicycle + network=rcn (currently with identical members). Alabama does have a segment of Natchez Trace Parkway in OSM, however, please note that this diverges significantly from the USBR 35 corridor. Tennessee's UGR segment is tagged network=rcn + ref=UGR + cycle_network=US:ACA. Note that Tennessee's network=rcn + ref=NTP relation both diverges from the USBR 35 corridor and is distinct from UGR. As it is much less clear (compared to Mississippi) that either relation is intended to be promoted to USBR 35, and no active project in the state is known of, neither route is additionally tagged ncn=proposed. Kentucky's DOT identifies a state bicycle route as a "USBR 35 AASHTO Identified Corridor" called "Ramblin’ River Bike Tour" (RRT), tagged network=rcn + ref=RRT + cycle_network=US:KY from the Mississippi River at Hickman in far western Kentucky to the South Shore at the Ohio River in northeastern Kentucky. No active project in the state is known of to promote this state route to USBR 35, hence there should be no ncn=proposed tag on the relation. USBR 37 Michigan 3391787 3391787 Wisconsin No relation yet IL (done), WI, MI Wisconsin appears to be waiting on completion of USBR 30 before progress on USBR 37 continues in that state. A route proposal is fully entered into OSM in Michigan (Upper Peninsula) as Michigan 35 from Menominee to Escanaba (continuing a potential USBR 37 in Wisconsin in or near Marinette), boosting this row to green. In Ohio, ODOT's Access Ohio 2040 transportation plan proposes a route for USBR 40 that follows the Great Ohio Lake-to-River Greenway in eastern Ohio but otherwise follows State Bike Route K, not yet entered into OSM. Hence, this is stalled here (as a "red proposed route") until further forward motion from ODOT or OSM discovers and presents a published Route K map available (in which case K should be entered into OSM as a network=rcn). USBR 40A Ohio No relation yet OH:LUC, OH:FUL, OH:WIL Not mapped yet. As part of ODOT's Access Ohio 2040 transportation plan, the proposed route would largely follow the Wabash Cannonball Trail Wabash Cannonball Trail and North Coast Inland Trail. The project awaits route data in the form of a map, turn-by-turn directions or a GPX file. USBR 50 West Virginia 3391787 3391787 Utah No relation yet DC (done), MD (done), PA (done), WV, OH (done), IN (done), IL, MO, KS, NE, CO, UT, NV (done), CA West Virginia is "pending." (Best data available). Leaders from Bike Utah and Utah's tourism, economic development and transportation agencies met with ACA Director Jim Sayer in 2017 to develop USBR corridors routes in Utah. In 2017-8 Nevada and Utah realigned USBR 50 and 79 corridors; ACA published a newer Corridor Plan / USBRS Progress map. USBR 76 Wyoming 3319536 3319536 VA (done), KY (done), IL (done), MO (done), KS (done), CO, WY, MT, ID, OR Incipient in Wyoming. The route will follow US 287 from near Jackson to Rawlins, then US 287 Bypass onto Wyoming 76 onto I-80 at Exit 221 to Exit 235 onto SR 130, then SR 230 to the Colorado state line, where it becomes SR 125 in Colorado. There are challenges with traffic and road quality inside Yellowstone National Park. A possible routing would go through Jackson onto SR 22 into Idaho. What IS known about this route is entered into OSM (this is what is meant if this row is green), but omits yet-to-be-determined routing through northwest Wyoming. USBR 79 Nevada 3318924 3318924 NV, UT (done), AZ In Nevada, USBR 79 emerged as Nevada State Route 487 from Utah northwest to US Route 50, ~11 miles. In 2017-8 Nevada and Utah realigned USBR 50 and 79 corridors; ACA published a newer Corridor Plan / USBRS Progress map. USBR 84 Alabama 1783198 1783198 SC, GA, AL, MS, AR, TX An Alabama DOT document from 2009 says on page 12 "it is recommended that U.S. Bike Route 84 follow the same route as the state bicycle route (EW2)." However, Alabama appears not to be further developing this route nor does it have an active project to bring it to AASHTO. This is tagged network=rcn + ref=EW2 + cycle_network=US:AL + ncn=proposed so the first two keys display a solid purple line badged with purple EW2 shields, and the last key superimposes a dashed red line (with no red 84 shields). USBR 90 3317166 3317166 FL (done), AL, MS, LA, TX, NM, AZ (done), CA Incipient in Alabama, Mississippi, Louisiana. In Alabama, USBR 90 is fully entered into OSM as it is proposed. In Mississippi, USBR 90 is seeded as SR 53 between I-59 and Poplarville, west to Crossroads via SR 43 and east via Silver Run, Ten Mile, Latimer and Vancleave to Alabama. However, no further specific route data are available. There was an initial glimmer of interest in this route at Mississippi DOT circa 2013 but it seems to have fizzled out. Mississippi demotes this row from green to yellow. In Louisiana, USBR 90 is fully entered into OSM as it is proposed. Green means that the route proposal(s) data are fully entered into OSM for the state(s) listed in bold and all that remains is AASHTO application and approval. After AASHTO approval, the route can be moved from the Proposed section to the Approved section. In Relation(s) column, "directional routes established." Yellow means "only partially specified" ; additional volunteer work is needed to enter or correct additional route data into OSM. Yellow may also mean a route has (a) volunteer(s) entering data, yet route ambiguities persist. Red means that "something" (often very little) is known about the early stages of a proposed USBR, so it is useful to put a row in the table about it as a placeholder, but it is too early to create a route relation in OSM: either the state DOT hasn't yet received enough local approvals, a route map is too early a draft, or route data are not yet complete. OSM-US has explicit permission from AASHTO to enter into OSM routing data from state applications for USBRs ("ballot items") as these are submitted by state DOTs (which may come from AASHTO's web site). This permission is documented by Robert Cullen, AASHTO's Information Resource Manager, dated July 31, 2015, sent to the OSM-US Secretary (Alex Barth at the time of request). Thusly, OSM volunteers are welcome to use state DOT application map data (which may come from AASHTO's web site) to submit proposed USBRs into OSM. Should such proposed USBR route data be submitted to OSM it is hereby expressly noted they are from an AASHTO publication which has copyright by AASHTO, and that explicit "Permission to reproduce and post these data has been granted to OpenStreetMap US by the American Association of State Highway and Transportation Officials." OSM-US thanks AASHTO for this permission. A 29 minute video of the history of this project from its early days to about April, 2014, when this was presented at State Of The Map - United States in Washington, DC. This page was last edited on 16 January 2019, at 19:40.